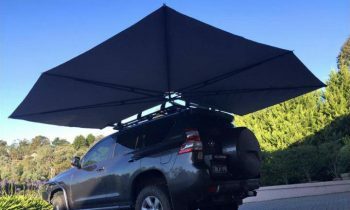 Clevershade™ awning sets up in 30 seconds!!! 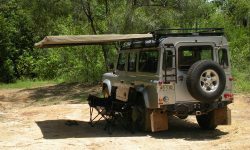 It mounts with one single pivot to a roof bar or roof rack, and offers a 180 degree or 270 degree awning. Quick to deploy, easy to remove and refit. 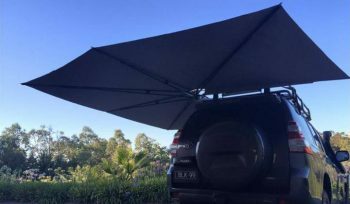 Creates heaps of shade, and poles can be used in extreme weather events. The canvas is available in different colours. Awnings provide shade, comfort, and protection against the elements when camping. Speed and ease of setup is of paramount importance to enable usage while en-route, e.g. for a quick stop at lunchtime. Special importance has been given to the design of the structure to ensure strong mounting to guarantee that the awning stays stable when the wind blows.